Much of the background information for this article is to be found in a booklet “Historic Sites of The Pas” prepared for The Pas History and Heritage Society. Many thanks to Paul Thistle, Curator, for providing this and other information for the preparation of this article. 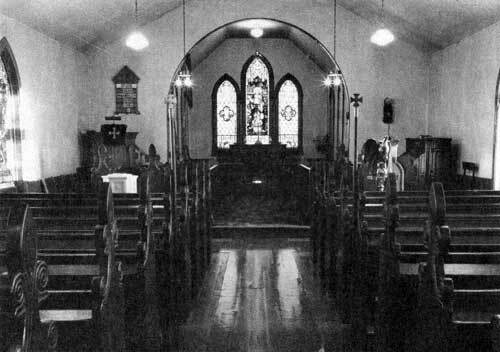 Interior of the Christ Church (Anglican), The Pas, 1948. The modern town of The Pas was incorporated in 1912 on the initiative of leading citizens Herman Finger, Gideon Halcrow and Dr. R. D. Orok. The natural advantages of the site had marked it as an important place for trade and settlement from the earliest times. In the 1870s, when the Hudson’s Bay Company began to use steamboats to carry goods to Fort Carlton and to the increasing number of settlements on the Saskatchewan River, The Pas represented a natural harbour because the Saskatchewan River became deeper there and the width of the Pasquia River provided protection. Several steamboats were constructed at Grand Rapids. The first to arrive at The Pas was the SS Northcote in 1874. Talk of a railway to Hudson Bay began in this same period with the earliest charter issued in 1881. Political manoeuvering between the federal and provincial governments delayed further activity until the commercial demands of the Finger Lumber Company, and its owner, provided the impetus for a branch line from the Canadian Northern Railway to The Pas in 1908. This was to be the beginning of the route to the Bay. The treaty with The Pas Band, an adhesion Treaty Number 5, was signed in 1876 registering 599 persons. By 1906, prospects for an economic boom became apparent. The Canadian government purchased land on the south bank of the river for the future town site from the Indians who were then moved across the river to the present site. In 1910 a town site plan was laid out and lots were placed on the market. The white population consisted of six families. By the time of incorporation in 1912 there were about 500 people, and in a Board of Trade census one year later the total was 1,509. The Anglican mission already had a long-standing presence in The Pas. It had been established by Henry Budd in 1840. The first church had been built in 1847 and was demolished when the present church building was being constructed in 1895. Completed in 1896, Christ Church Anglican is the oldest building now standing in the town. A Roman Catholic priest, Ovide Charlebois, took up residence in The Pas from Cumberland House in 1911 as the first Bishop of Keewatin. The next year, the Grey Nuns came to provide teaching and nursing for the parishioners. A large school was built in 1917, a Cathedral in 1922 and St. Anthony’s Hospital in 1929. The Catholic students attended the private school to Grade 8 and then transferred to the public high school. Sacred Heart offered a commercial course which many young people in the community attended to prepare themselves for employment. In addition to the construction work on the Hudson Bay Railway from 1912 to 1917, there was considerable shipping activity on the river. The Ross Navigation Company built three steamships during these years, and these boats, along with several other steamers, were active into the 1920s. As evidence of the importance of The Pas as a distribution point for centres in the north, Western Grocers opened its operation there in 1920 and two warehouses were built. As additional buildings were required, premises were rented in various areas of town. In 1926, the company erected a new three-storey warehouse and then added two additional stories in 1928. Rapid growth in the second decade of the twentieth century had been the impetus for building a powerhouse on the banks of the Saskatchewan River in 1913. At the end of the 1920s, the original powerhouse was torn down and a new one erected. The power was generated by a diesel engine. In later years, this sturdy structure would be used as the town offices, as a fire hall, as a public works depot and as the town garage. It is now the Public Library. A series of grand houses was built on LaRose Avenue in the early 1920s, with prominent owners being Ben Dembinsky and H. F. Bickle, both one-time Mayors of the town. Their homes are at 231 and 327 LaRose Avenue respectively. The street was named for Dr. LaRose who had come in 1902 to serve as medical officer for Indian Affairs. His house at 315 is one of the early existing homes. 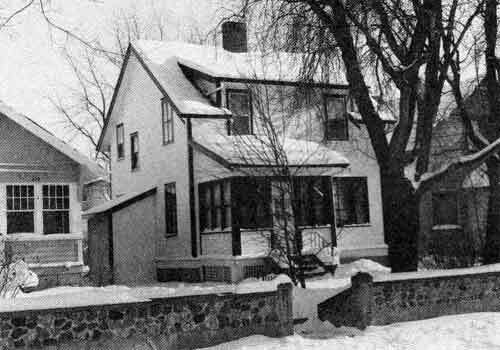 A particularly fine home at 353 was occupied by the Northern Supervisor of the Natural Resources Department and his family during the 1940s. In the 1960s this same house was turned into offices for the RCMP. During the 1920s Canadian eyes turned northward. Aerial photography was beginning to be used to complete detailed surveys of the immense rock and bush land in the north. Ore bodies had been identified but were inaccessible and hence left undeveloped for the most part. Further discoveries of copper at Flin Flon and Sherritt, the existence of a marble quarry site on the railway line, the increasing value of pulp and paper, and the hydro-electric potential of the rivers in the Canadian Shield all brought about heavy political pressure to complete the interrupted construction of the rail link to the Bay. The bridge over the Saskatchewan River had been in place since 1913, but rail line construction had been halted at kettle Rapids on the Nelson River due to the scarcity of material during the war. In 1924, the agitation began in earnest, and the line to Churchill was completed in 1929. The branch into Flin Flon was in operation in 1928, and to Sherridon in 1929. 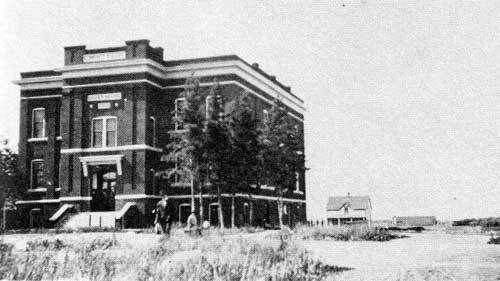 In 1930, the western provincial governments took over control of their natural resources and Manitoba set up the headquarters of its Northern Forest District at The Pas. Many of the government officials had their offices in the brick Court House and Community Services Building which had been built in 1916-1917 on Fischer Avenue. This building is being renovated for the use of The Pas History and Heritage Society. 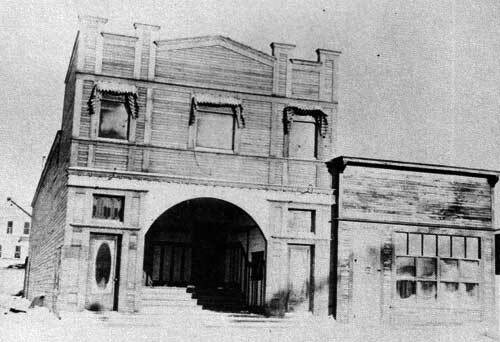 The Lyric Theatre, The Pas, Manitoba, 1925. In 1932, the Manitoba Government Air Services took over the Air Forces base at Cormorant Lake. During the war an airport was constructed as a part of a staging system for the US Air Force from Northern California to England on the great circle route and subsequently the bases was used in the construction of the DEW Line and aerial photographic surveys. 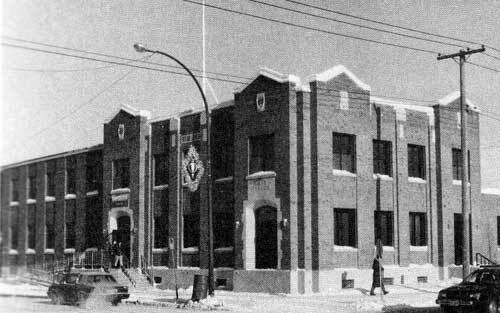 Also in 1932, the two-storey Post Office was constructed at Fischer Avenue and Second Street. By the 1940s the beaver had been almost depleted in its northern habitat. Considerable effort was being made by the Department of Natural Resources to conserve and increase the game and fish resources in the north in order to provide a continued livelihood for those dependent on these resources. The government decided to implement a system of registered trap lines as suggested by Harold Wells. The Natural Resources officers stationed at The Pas under the supervision of Gerald Malaher carried out negotiations with the Indian Bands and independent trappers in the north to settle the boundaries of each trapper’s territory. About the same time rehabilitation work was done in the Saskeram and Summerberry marshes to increase the yield of muskrat pelts. A Fur Advisory Committee was set up which would set the quotas of muskrat and other fur that could be taken. Lucrative fur markets in the USA encouraged illegal trapping of beaver. Game wardens and the RCMP vigorously prosecuted the offenders in order to give the new conservation measures a chance to succeed. The fur industry was still an important factor in the north, as it had been since the beginning. Post office, Fisher Avenue and Second Street, The Pas, 1988. Dembinsky house, 231 La Rose Avenue, The Pas, 1988. Civic offices and court house, The Pas, 1925. The town has many of the same components today as those that created it and caused its growth. Furs, the forest industry, mining, distribution of goods, and government administration have made The Pas a crossroad. The north seems to generate interesting personalities and stories. Many of these are identified in the 1983 history The Pas, Gateway to Northern Manitoba edited by Sydney Allen, and in The North I Love by Gerald Malaher.